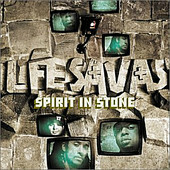 Portland, Oregon duo Lifesavas put Portland on the hip-hop map with Spirit In Stone, their debut. Comprised of Vursatyl and Jumbo the Garbageman, Lifesavas' Quannum Projects release (the label owned by Blackalicious' Chief Xcel) showcases the duo's years of hard work, live shows, and demoing. Spirit In Stone is a realization of all those years, and a fine slab of hip-hop at that. From smart to witty, political to spiritual, Jumbo the Garbageman's production and beat delivery is executed to a tee. Alongside Vursatyl's rhymes, the combo an infectious, if not danceable groove that locks you in and never lets you go, recalling their De La Soul influences, while flowing beyond those limitations and driving things home with plenty of other styles, too. Spirit In Stone is an excellent representation of Northwest hip-hop and, hopefully, the record that will draw attention to the burgeoning scene, the upcoming hip-hop scene that has long been overlooked. That good to draw national attention - and warrant - here is a record that forgoes the stereotypes of hip-hop and serves up a sophisticated, well-informed, proper representation of what hip-hop should be. I'll give it an A.